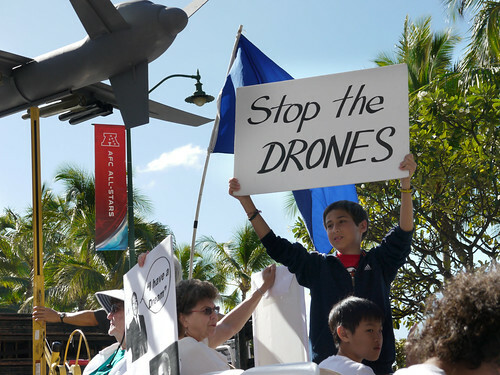 National Days of Action to Stop Drone War in April. Click for more info. The Senate Intelligence Committee voted to send the nomination of John Brennan as CIA Director to the full Senate, as we knew they would. After sparring with the Obama administration over how much information the Committee would be given on the U.S. drone program, they got some, though the public did not. The Obama administration, Holder said, rejected the use of military force where “well-established law enforcement authorities in this country provide the best means for incapacitating a terrorist threat.” But in theory, it’d be legal for the president to order such an attack under certain circumstances, Holder said. Holder’s answer was more detailed, however, stating that under certain circumstances, the president would have the authority to order lethal attacks on American citizens. The two possible examples of such “extraordinary” circumstances were the attack on Pearl Harbor and the 9/11 terrorist attacks. Which leaves the U.S. military, which specifically is now authorized to operate in the United States via the National Defense Authorization Act for 2012. See Kevin Gostzola: Attorney General Eric Holder: US Government Has Authority to Target & Kill US Citizens on US Soil. This entry was posted on March 7, 2013, 1:35 am and is filed under covert drone war. You can follow any responses to this entry through RSS 2.0. You can leave a response, or trackback from your own site.